As "Breaking Bad" careens violently toward its series finale, many plot points are still up in the air: Will Walt escape the law? Will he reclaim his money from the Aryan Brotherhood? Does baby Holly stand any chance at avoiding severe psychological trauma? As an office full of "Breaking Bad" fans, we at Survata were curious if viewers wanted a sympathetic ending for Walt despite his moral corrosion. We surveyed 721 respondents (who stated they planned to watch the series finale on Sunday), asking which ending they prefer for Walt, and which ending they predict will occur. We found that many fans hope the finale will be an "A1 day" for Walt. 24% of respondents said they prefer that the series concludes with Walt reclaiming his money and evading police. 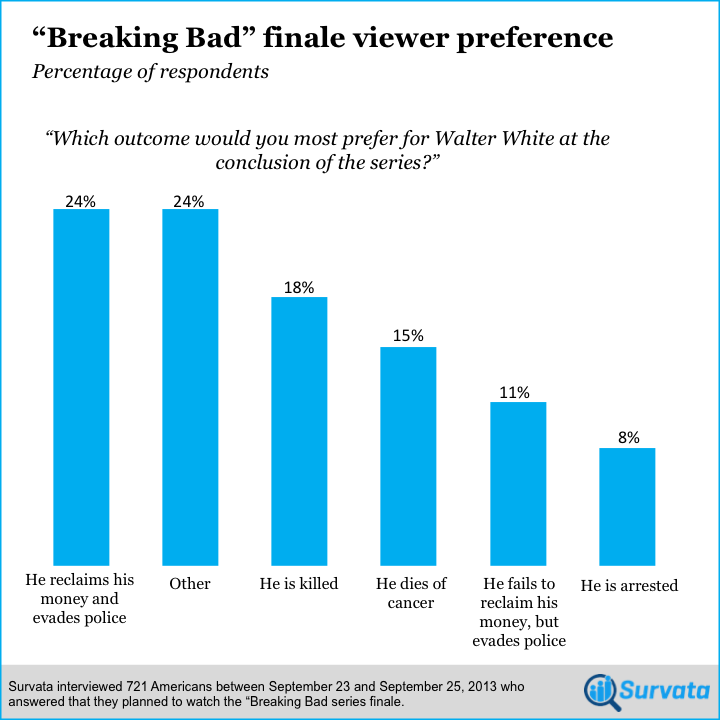 Significantly fewer viewers want Walt brought to justice, as only 8% of respondents said they prefer the show ends with his arrest. Female "Breaking Bad" viewers may have reached their quota for violent confrontations, as they were over 40% more likely to prefer a natural death for Walt. 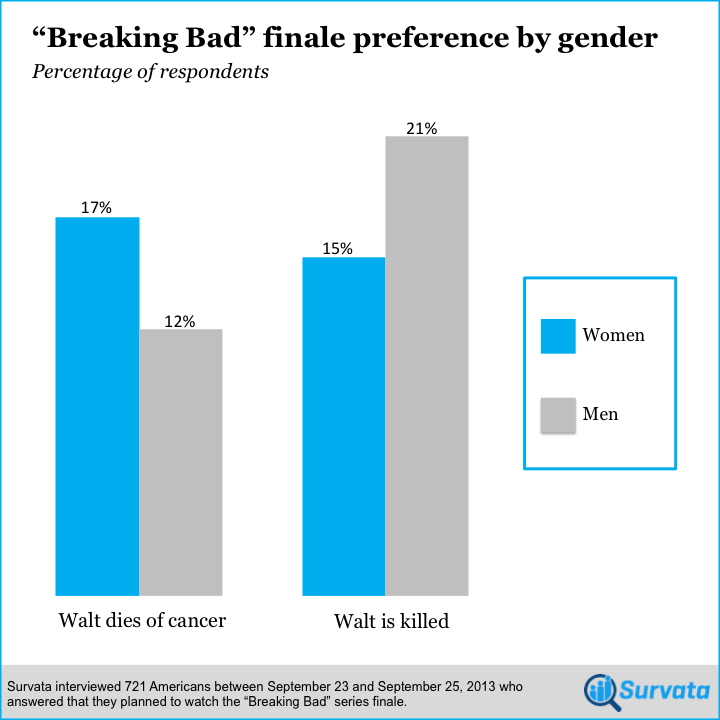 17% of female respondents said they prefer Walt dies of cancer, compared to 12% of men. Conversely, 21% of men hope that Walt is killed, while 16% of women hope for such an outcome. Looking at what viewers predict will happen (instead of what they prefer to happen), we found no standout prediction for Walt's ultimate fate. 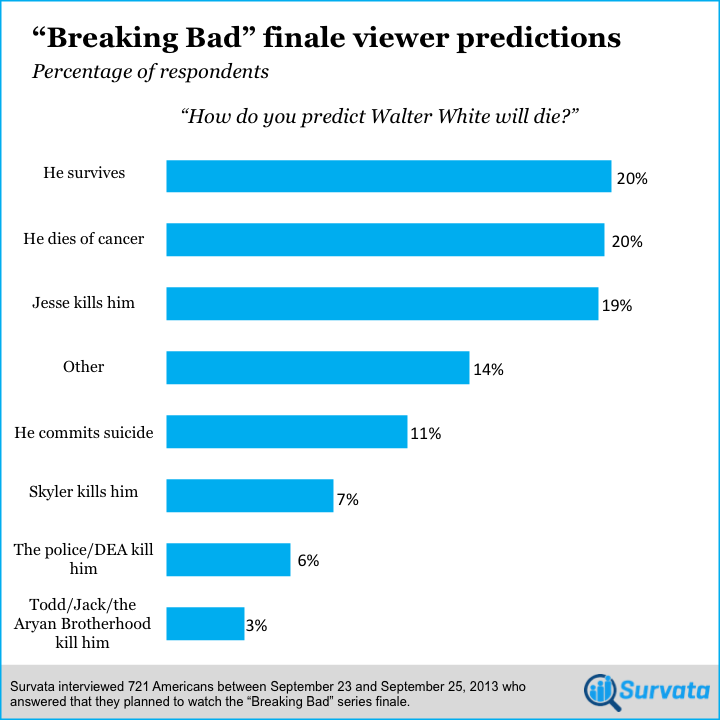 20% of respondents predicted that Walt would survive, while a nearly equal number predicted that Walt would die of cancer or be killed by Jesse Pinkman. The least selected prediction (at 3%) was Walt being killed by Todd, Jack, or another member of the Aryan Brotherhood. Although we can only speculate about how the final minutes of "Breaking Bad" will play out, we can say one thing for certain: Regardless of what happens, many viewers are bound to be surprised by the finale. Want to run your own nationwide survey on pop culture? Build a Survata survey in minutes.